This was a recipe that happened by chance as in my household it is very rare we eat goat / mutton meat. Also there is no recipe I know of, in Goan cuisine with goat meat. 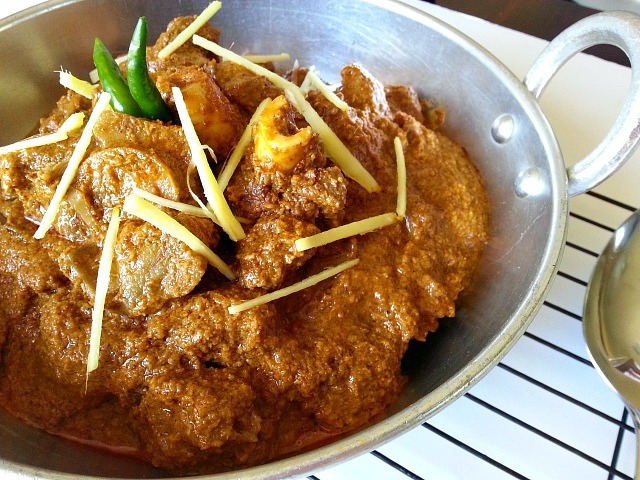 The two popular meats used in Goan recipes are beef and pork and occasionally chicken. You can use lamb as well to replace the goat. I prefer goat as it is less gamey tasting than lamb. I also found out it is a great alternative to red meats. It is leaner and a much healthier choice when compared to equal serving sizes of chicken, beef and pork. If you own a pressure cooker then this recipe is much quicker to make. You will also need a mixer/grinder to grind the roasted coconut. It does take patience and time but the final outcome of the Goat Xacuti Curry makes it all worth it. The curry has a beautiful roasted spices and coconut flavor that is so unique it make you want for more. 2 lbs of goat meat trimmed of skin and fat. Wash and cleans the goat meat, apply salt, lemon juice and refrigerate for 30 minutes (applying salt & lemon juice seasons the meat better). Heat a non-stick pan add the grated coconut and saute it on medium heat for 15-20 minutes till it is toasted to be lightly brown. Add the xacuti masala to the coconut and roast it for another 2 minutes.Take off heat and keep aside. Next add to the same hot pan quartered onion and roast till soften. In the ninja single serve cup add the coconut mixture, onions, ginger, garlic along with 1/2 to 1 cup water and grind it to a paste for about 2-3 minute (If required grind it in 2 batches). Heat oil in a pot, add the ground paste and saute for 1 minute till well blended. Add the goat meat and saute for about 3 to 4 minutes till mixed well. Cover and cook for 15 minutes. Next add the remaining water, coconut milk and check on the salt. Add salt to your taste if required. Cook covered for another 1 hour and 15 minutes on medium heat. Keep checking and stirring every 15-20 minutes. Till the meat has softened and the gravy thickened. If you do add the curry leaves then add it 5 minutes before you take it off the heat. You can enjoy it with rice, Ciabatta Bread or Appam (A gluten-free rice pancake). It taste better the next couple of days. If you are not a big fan of goat than try my recipe for Chicken Xacuti or Beef Xacuti. Looks amazing. I cannot make this. I will crave it for days. Yummy!! I made Jamaican curried goat two weeks ago.. 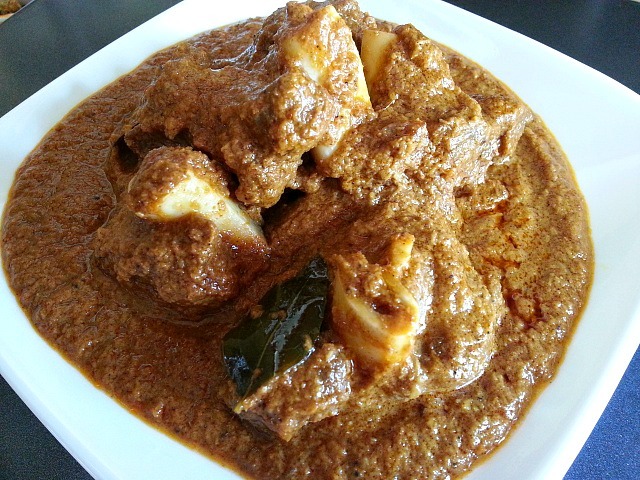 I want to make Goan curried goat now!! Mouthwatering recipe. Thank for sharing this. My favorite. My husband loves goat meat. I haven’t actually tried it because when he gets it is spicy hot and I don’t eat spicy hot stuff! Terre next time just mix plain yougurt, about a tablespoon or so to the gravy it will reduce the heat. Thank You for your kind note and for sharing about goats. 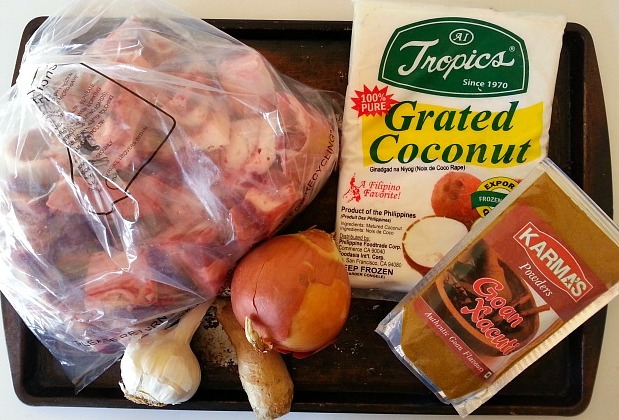 After posting this blog post I found out goat meat has different names in different countries. Here too goat is not found easily at the local grocery store. Would love to hear how the recipes turns out when you give it a try. That is the whole idea ;-). I know it used to confuse me as well. My husband loves Goan meat curries! He’s gonna enjoy this recipe for sure! 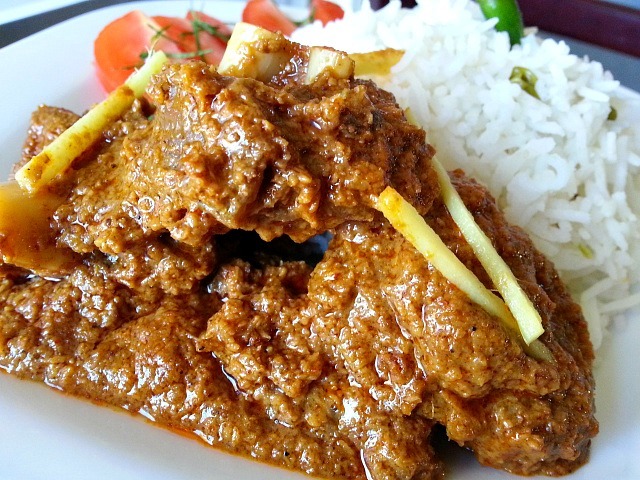 If only goat meat was easier to come by I would definitely have this on my curry rotation! Laura, you can also use chicken or beef. How would you describe goat meat? Taste like chicken or ???? It is very similar to beef in texture and taste but much leaner. Frozen grated coconut is not something I’ve ever found. The dish looks amazing. Johanne, you may find it where there is either Asian or Indian community store. As I live in Los Angeles it’s easily available. I have never had goat before! You should try it Christy. It is a much leaner meet and a great replacement for any red meat. Nice images. Looks delicious, and I like goat meat. Oh la la, the famous Goan Xacuti delicacy :)) A staple in Goan homes around special events. I too love mutton and goat, I guess I love goat more as it has so many bones that you can chew on with all that delicious gravy. Your photos too are great, the lighting really captures this dish :). Great job! Thank You so much sweet Loretta. You are always so kind to me :-). Hope all well with you. This looks great, the texture looks lovely. I do enjoy mutton but rarely choose goat – I may have to re-think that! Thank You so much. Goat and mutton is the same in Asian countries it is called mostly mutton. Mmm… That looks lovely. I love goat. The first time I had goat was when I visited a village wedding near Ndola in Zambia. It was one of the tastiest meals I’ve ever eaten. I love mutton- goat meat too and your Xacuti has me drooling! Oh My goodness! I’m drooling right now! I love, love, love goat! Looks so delicious! Nandini can you do me a favour ???? I always find your recipes very tempting and suitable for me. Can you make a guest post for me ????? Any authentic Goan recipe will be perfect, preferably non veg dish. Thank You so much Jayeeta :-). It’s going to be my favorite too specially since I found out it is much healthier than the other meats I eat. Thank You for the offer as well Jayeeta :-). I have’nt done a guest post before. You will have to let me know how you want to publish it. I may need a couple weeks to prepare if that is ok with you :-). Let me know. Thanks for your response to my request, Nandini. To make the guest post you have to send me the recipe and images by email. Then I will post it in my blog and let you know the schedule of the post. After that you could post it in your blog. There is no hurry, you take your time. Just let me know which dish you are choosing. When you are ready for the post just inform me…..I will send you my email id……. Thank you for the YummY recipes. Easy to be kind with kind talented people.